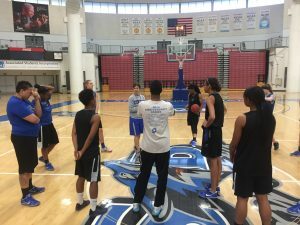 The CSUSB women’s basketball team determination on and off the court lead to a 67-59 victory against CSU Dominguez Hills on Feb. 11. Basketball season is in full effect, and playoff selections are happening in about two weeks. Women’s basketball is currently sitting in fifth place out of 13 teams in the California Collegiate Athletic Association (CCAA) conference, according to the CCAA website. The top eight teams in the conference will move on to compete in the playoffs held at CSU San Marcos on Feb. 28. The Coyotes current overall record is 13-7. The hard work they produce off the court is what makes them so successful on the court. They focus on the mental and physical aspects of the game to give them an edge over their opponent. They train six days a week to keep themselves in top shape to face their competition. In addition to training on the court, they visit the strength and conditioning center one to three times a week to prepare their bodies physically. For mental preparation, the team is given scouting reports of the opposing team a week in advance. They study the reports constantly and are quizzed on information prior to the game. Each player of the opposing team is analyzed and the team is given detailed instructions on how to play against them. Film compilations of the opposing are shown to the Coyotes in order to analyze their opponents. Head Coach Susan Crebbin is constantly analyzing different tactical advantages her team can use over their opponent. The morning of the game, the team meets in the Coussoulis Arena. They assess plays scouted from the opposing team, as well as practice shooting so they are confident and ready for the game. Three hours before tip-off, the team loads up into three-door vans and begins the one or two-hour drive to the game. Prior to arriving, the team stops to get food to fuel themselves for the 40-minute game. “The players must eat before their game so they have the energy to perform and keep them going on the court,” stated head athletic trainer Laura Tropila. The team arrives at the gym one hour before the start of the game. They are free to shoot around or head to the locker room to get themselves focused. “Before every game, I listen to music to get my mind right,” said women’s basketball guard Sabrea Coleman. Once the clock hits 5:30 p.m., it’s time for the team to put all of their preparation to the test. Forwards Mya Johnson and Genaya Wilkonson lead the Coyotes by scoring in the double digits. Their defense was solid throughout the game which led to the eight-point win. Coyotes need just one more win to secure their berth in the conference tournament.